Hannah (Minerd) Murray was born in 1845 in Hexebarger, near Kingwood, Somerset County, PA, the daughter of John and Sarah (Ansell) Minerd. Her and her husband's untimely deaths left their seven young children as orphans. When Hannah was about 20, she moved with her parents to nearby Normalville, Fayette County, PA. 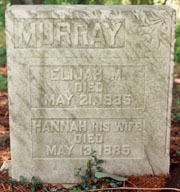 There, Hannah married Elijah M. Murray (1845-1885). Their seven children were Perry M. Murray, Agnes Kern, Marcellus Murray, Ida Ritenour, George M. Murray, Rachel Ruamy "Amy" Cole and Hannah "Lucy" Eicher. 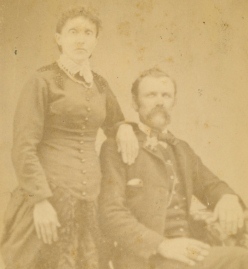 The Murrays' photograph portrait on this page is the only known image of this couple. It was taken at Ward Studio in Connellsville, Fayette County. Building a life together with their large family, the Murrays moved into a new house in Normalville in April 1881, a fact reported by the Connellsville Courier. But their family shortly thereafter was shattered by unspeakable sadness and loss. On May 13, 1885, just a day after giving birth to her seventh baby, a little girl, Hannah died, at the age of 40. Elijah was left a widower with seven children, one of whom was just a day old. But grimly, Elijah was not long for this world. Eight days later, he also died, of a combination of broken heart and typhoid fever, leaving their children as orphans. The Courier said that "The good neighbors have taken the little ones and will care for them as best they can." ...The dual calamity is keenly felt in this community, and we can but commit the poor parentless orphans to the tender care of the Good Shepherd who tempers the bleak winds to the shorn lambs, and that they may find kind welcome into good households. Food, clothing and shelter is the Savior's injunction. Hannah and Elijah are buried together at Normalville Cemetery, behind the Normalville Methodist Church, under the tall pine tree. Their upright grave marker is still very legible today. Hannah's mother Sarah Minerd, and son Perry Murray, as well as infant nieces and nephews, all rest in the same row. Five years after the parents' deaths, in 1890, daughters Ida and Lucy were legally adopted by their older first cousin Richard S. and Mary Jane (Whetzel) Murray. Richard Murray went on to become Springfield Twp. tax collector. In 2011, a book re-published by Donna Murray Allen, The Murray Family of Fayette County, PA, 1799-1999, devotes three full pages to Hannah and Elijah's tragic story, including their photograph. She writes that "I feel their story is a vital one to include in this family history. By doing so, it keeps their memories alive. And it will help future researchers with their arduous task." She also acknowledges Minerd.com founder Mark Miner for providing material for the chapter. Allen previously wrote about Minerd.com in the December 2008 issue of Internet Genealogy magazine, headlined "Bringing Family Together - What Makes Minerd.com a Top Family Website," and in a 2002 article in Florida's St. Petersburg Times entitled "Family Web Sites Help You Find the Past in Cyberspace."